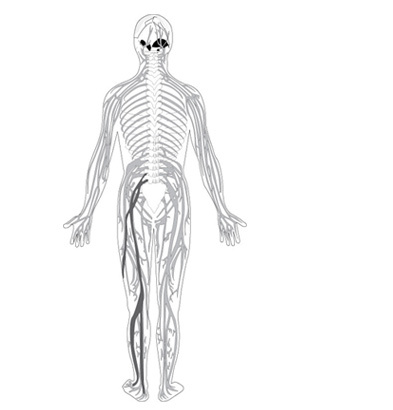 What is a Peripheral Nerve? Nerves run throughout the body, carrying messages for movement and sensation. The nervous system is divided into two parts – the central nervous system and the peripheral nervous system. The central nervous system lies in the “center” of the body and is made up of the brain and spinal cord. The peripheral nervous system extends out from the central nervous system to the extremities, such as the abdomen, groin, knee hands and feet. As nerves travel through the body, certain areas along their course are “tighter” than others, causing problems for the nerve and its function. In these areas, nerve compression can result, characterized by numbness, tingling or chronic pain. Areas of tightness can be in the groin, hands, feet or legs. One of the most common types of compression is carpal tunnel syndrome. Factors leading to nerve compression include diabetes, trauma or injury, chemotherapy, toxins or conditions which are unknown. In many diabetics, the nerves supplying the extremities of the body swell and stiffen, leading to the same symptoms as nerve compression. This condition is known as diabetic neuropathy. For some patients the pain and numbness from diabetic neuropathy is treatable, but not every patient is a candidate for surgery. Some peripheral nerve problems are due to injured nerves, not due to compression. In those cases, a neuroma can result. This is an abnormal swelling of an injured nerve, resulting in pain, paresthesias (zinging sensation), and numbness. In that case, the injured nerve is typically found, trimmed back, and buried in muscle and soft tissue to prevent it from causing further pain. When a nerve is cut, the piece of nerve that is beyond the cut point eventually dies, however, the cut end of nerve will send out multiple sprouts in the direction of the nerve growth factor in all directions and eventually cluster and form a knot of nerve fibres. This eventually leads to the formation of a neuroma. If it is in a place on your foot where you put a lot of pressure, it will become very painful. Morton’s Neuroma is another type of peripheral nerve problem in the foot. The pain is caused by the repetitive compression of the common plantar digital nerve. This nerve lies between the heads of the metatarsal bones. Consequently, the neuroma that develops is not a true neuroma, but rather a manifestation of chronic nerve compression. Rosenberg Plastic Surgery is part of a network of select surgical practices that have received training under Dr. A. Lee Dellon, a pioneer in the field of peripheral nerve surgery and founder of the Dellon Institutes. Dr. Rosenberg devoted a year of extra training (aka a “fellowship”) after residency dedicated to the study of peripheral nerve, both with Dr. Christopher Maloney, a peripheral nerve surgeon in Tucson, AZ, and Dr. A. Lee Dellon, in Baltimore, MD. Dr. Rosenberg is active in research in this field, and performs cutting edge procedures which are performed only at select places in the country.